The charity International Foundation for Mother and Child Health (IFMCH) is holding a fashion show at the Sheridan Suite in Manchester next week on Friday 21st September. 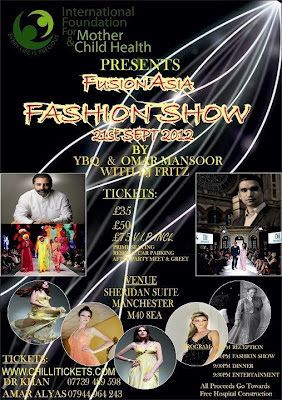 The fashion show will be featuring designers Yousuf Bashir Qureshi (YBQ) and Omar Mansoor. All proceeds from this event go towards building the free hospital in Mirpur Sakro, Pakistan. Tickets for this event are split into three different price bands - £35, £50, £75 and alongside the fashion show, there will be additional entertainment and a 3 course meal. I'm usually a little cynical when it comes to charity events like this, but having attended IFMCH's 2010 charity fashion show and had the opportunity to meet the founders of the charity as well as the designer YBQ himself I can vouch for the work they do. You can find out more about the event and how to purchase tickets via the IFMCH facebook page. Let me know if you're attending - I'll be there!